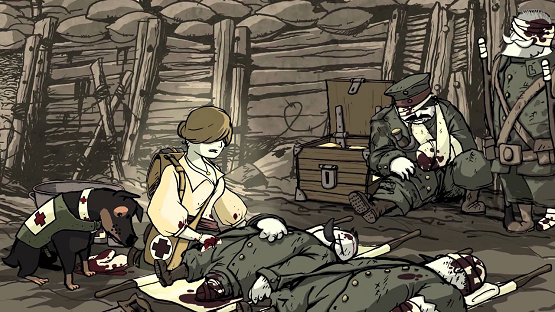 Valiant Hearts: The Great War is a fine example that games can be better than movies. This game guides you through an extremely emotional story with perfect pacing and unfailing intrigue, all in a way that contrasts the harshness of war with detailed illustration. If you’re a thankful child, a doting parent, a committed couple, or someone who has experienced loss of a loved one, you’ll feel this game. That’s a huge accomplishment since it’s a relatively simple, linear game. 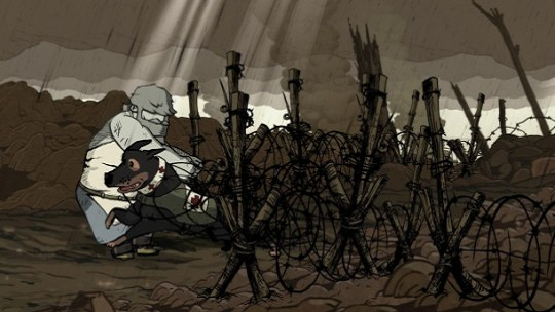 One reason Valiant Hearts may be dismissed or looked over is the type of game and art style it uses. Surely a linear game with point-and-click style puzzles can’t be entertaining for very long, right? Maybe in any other game, sure, but this game uses its chosen style to expertly deliver a story that packs a punch. The puzzles in the game are impressive too, because I never got tired of them. They are varied and relevant to the surrounding environment. I expected at least some puzzles to repeat themselves in slightly different ways, but never noticed that happening. I was sufficiently challenged and entertained at the same time by the quandaries. They didn’t feel cheap, they felt realistic. Like, if I was really living in this story, I might actually come across each particular environmental challenge. The game was a good length too, especially for a downloadable title. I completed it in about six to eight hours, and was never tired of it during my time playing. And I will note, I never once felt like quitting due to a challenging puzzle — I admit, I get frustrated quite quickly and want to quit if a game has stupid puzzles. This doesn’t mean they weren’t challenging, but rather, means I was entertained the whole time. That takes a fine balance to make me continue on with a hard puzzle and enjoy my experience at the same time. The challenge of the game was not only in puzzle form. There were many stealth scenes too. It was so satisfying to successfully complete these parts, just because I was so invested in the story and the characters involved. I absolutely loved the canine character, Walt. He played a very important part in both the gameplay and the story. 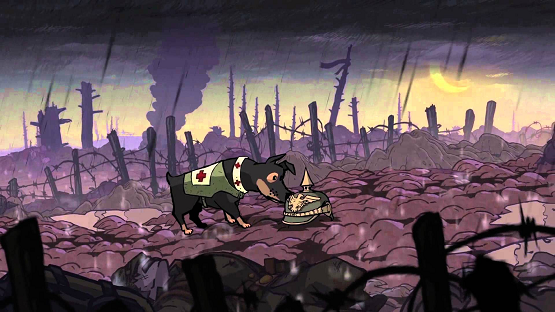 If you’ve seen the trailer for Valiant Hearts, you might notice that the dog is sort of the tying element throughout the game. He really is, but it’s subtle and his character is a great aspect of the game that adds a lot of weight to the experience. When you play through the game, you get to see the hardships of World War I through the eyes of four different characters whose destinies cross in unexpected ways. Each of the four characters are very relatable and their anecdotes help convey the gravity of WWI. As you progress through the story, you will be able to read each character’s diary entries, which sinks you into their lives even more. 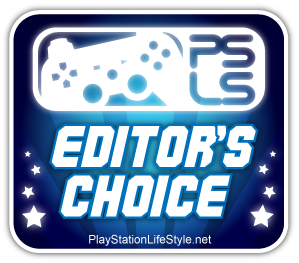 Some games choose to tell the story with no narration and have silence speak to the gamer, but not Valiant Hearts. I was glad to have a single voice guide me through the events of the characters and the war. The quality of the narration solidified the seriousness of this event. Narration was supplemented by minor voices done by the cast when they read letters or exclaimed on the battlefield. Voice acting in the game was obviously just as thought-out and artful as the rest of the title and tied the story together beautifully. Aside from Valiant Hearts‘ personal story, you get to see what was really happening at the time in WWI with the historical entries that are unlocked at each new turning point in the tale. These come with real photographs from the war, as well as accurate historical facts with each one. Ubisoft partnered with Mission Centenaire 14-18 to certify the accuracy of all historical content in the game. Everything being historically accurate adds a depth to this game that I didn’t anticipate. I didn’t realize how important that would be to making Valiant Hearts so poignant. I personally enjoy learning about history in any form, and this title was an impressive format to learn from. The environment of the game is also historically accurate. Along my journey I was constantly marveling at the illustration of the environment and the characters. It was like strolling through a charming, witty little comic book, whilst gritting your teeth over the hardships in the story. 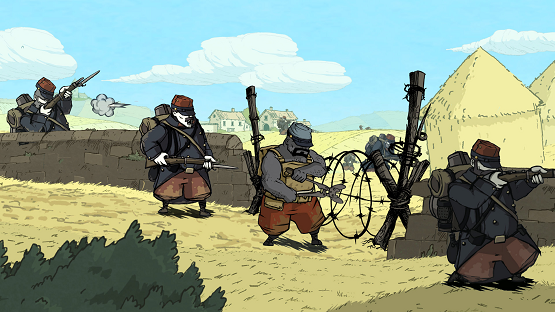 This game uses the beautiful UbiArt Framework engine (the same engine used for the recent Rayman games), which is perfect for telling the stories Valiant Hearts sets out to tell. Great illustrations visually summarize the world they are illustrating and highlight the important parts — which are the bits that make you feel and see the most. In the game, all the character’s eyes are covered by hair or hats. I took this to symbolize the hardships of that time. I also came to that conclusion because the only eyes not shielded — besides people from flashbacks of before the war — are the eyes of an important child. This child keeps multiple characters hopes up when all hope seems lost. This detail shows how carefully this game was created by using art to show you emotions. A great game is nothing without its soundtrack. I was happy to find that famous classical music appears in Valiant Hearts, and tactfully. Besides that, its own unique soundtrack is haunting and perfectly designed for each level. By the end of the game, even hearing the main song play on the menu screen could make the emotions of the game snap back into focus for me. I especially enjoyed the atmosphere created by the sound design and the illustration for each new environment, whether it be a festive street in Paris, a prison camp at dusk, or the middle of a war torn battlefield. This game made me shed more tears than any game I have ever played before, and I find that I am not alone in that sentiment. I even think this game communicated parts of WWI so well that it could be used as an educational tool, though the characters’ story is fiction. I want my friends and family who don’t seek out history for fun or play video games to play Valiant Hearts. I want to show this game to my favorite history teacher in high school– who was also a soldier and a lover of fine art, to see what he thinks, though I feel that I already know the answer. I want to tell everyone how wonderful and important the complete experience of Valiant Hearts: The Great War is so that many more people can enjoy it. Oh wait, I think I just covered that last thing. Soundtrack is haunting and expertly implemented. Characters are believable and feel real. Lots of sads (only a negative if you have no heart). Will expose if you have no heart (if you don't cry, you have no heart).